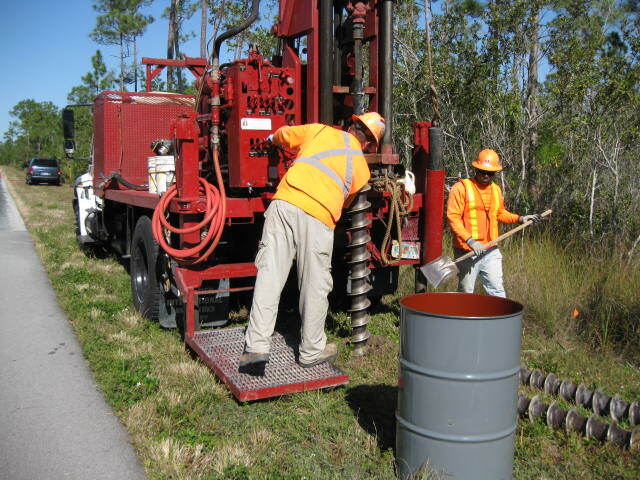 AM Environmental, LLC (AM) is a State of Florida licensed Geology/Engineering Company and Pollutant System Storage Contractor. The company is on the DEP's approved list of Emergency Response Contractors for Palm Beach County and is a Certified Small Business Entity, (SBE), with the South Florida Water Management District and Palm Beach County. With over 25 years of environmental consulting experience in South Florida, AM is uniquely positioned to design, develop and implement innovative assessment and remedial plans to provide cost effective solutions for difficult projects in Florida. Prior to purchase of a farm equipment maintenance facility, a due diligence investigation was performed to identify potential environmental liability associated with the property. During the investigation widespread petroleum, arsenic and to a lesser extent pesticide compounds were discovered in the soil and/or groundwater. Therefore an Interim Source Removal Work Plan was submitted to the Florida Department of Environmental Protection (FDEP) for approval. At this juncture AM Environmental was retained to conduct Source Removal and preparation of a Site Assessment Report.